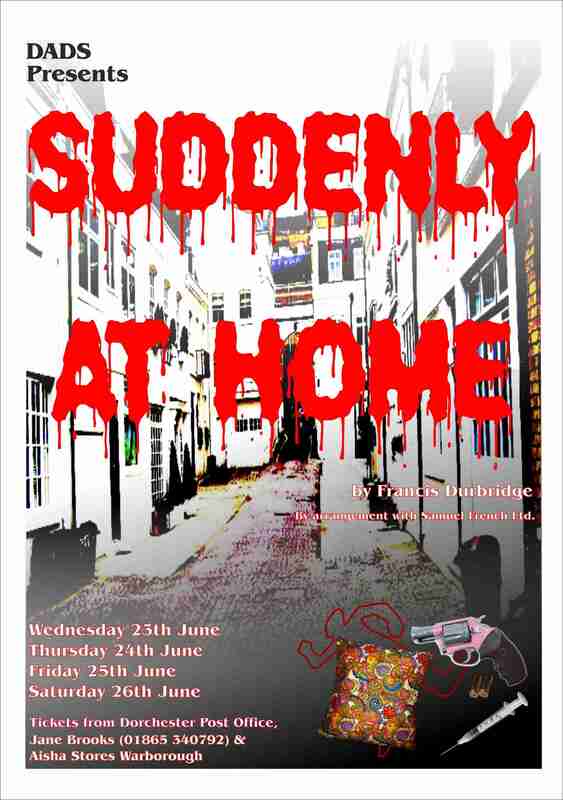 It’s always fun to try to second guess the action in a whodunnit, but DADS’ latest production, ‘Suddenly at Home’ by Francis Durbridge, was so full of twists and turns that to do so would have made you positively dizzy. For those readers who did not attend the performances (shame on you!) the plot centered around Maggie (wealthy wife), Glenn, (greedy husband) and his secret love, Sheila, who mistook Glenn’s ability to supply her with her regular heroin fix for undying love. After a rather slow start (the blame rests with Durbridge, not the cast), the plot really took off with the energetic smothering of Maggie, excellently played by Jane Brooks, who we were all sorry to see dispatched so soon. Ghastly Glenn was, of course, the perpetrator of this dastardly deed, and if you ever see Mark Wilkin holding a cushion, run for your life! He played the part of the suave, yet murderous Glenn to perfection, despite appearing to drink a huge amount of whisky during the performance. Rosemary Mills provided the perfect foil to this loathsome lothario; she exuded a chain-smoking nervous tension, only dispensing with her cigarettes in order to throw herself into a passionate embrace with wife-smotherer Glenn. The way seemed clear for Glenn to claim his inheritance and disappear with Sheila. However, Maggie’s sister, Helen, played by Lucie Hall, was to prove a serious spanner in the works. Lucie’s role was quite challenging, having to play sister to Maggie and also beleaguered wife of (invisible) Alec who occasionally rang to berate her for various reasons, and Lucie coped with these demands admirably. So far, no mention of Sam, aka Mark Williams, who was Maggie’s ex-lover. Mark seems to have a knack of being able to play a hero or villain equally credibly, and this role allowed him to exercise his heroic talents. redoubtable Geoff Russell complete with Clouseau-type mac and nifty notebook? We thought he had a sidekick in the form of Superintendent Remick, played immaculately by Matthew Sparling but no! This proved to be a ruse devised by our Sam/Mark hero in order to trap ghastly Glenn. No mention has yet been made so far of the seemingly innocuous housekeeper, Ruth, played excellently by Carol-Anne Tilley. We should have realised that her sinister, East-European accent meant that she was both a wife-stealer (yes, another one – lucky old Glenn) and also colluding with Glenn to bump off Sheila. As usual, with a DADS production, the set was first-class; for those of us too young to remember the seventies, I’m sure it was accurate to the last detail. Special mention should be made of Michael Herbert, who built a set sturdy enough to stand the rigours of murder and adultery, and also enabled the audience to have a grandstand view with his raised auditorium. Finally, a round of applause for Alex Watts’ able directing and to producer, Terry Chipperfield. Terry also prompted, and it is to the cast’s great credit that for most of the play, he was silent.